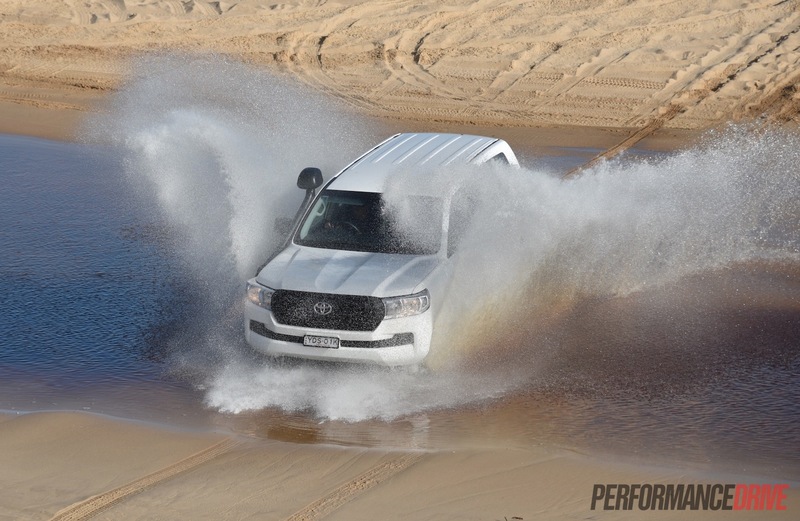 Toyota’s dominance in the flooded SUV market continues to thrive. 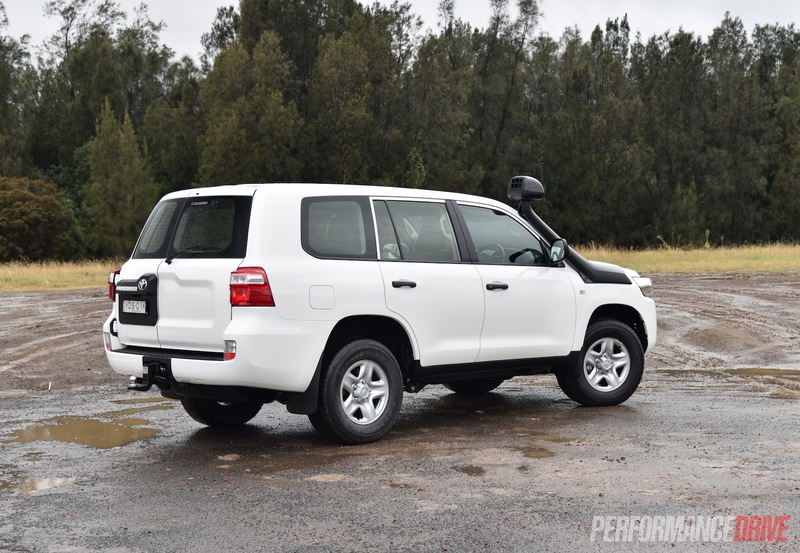 At the top of the food-chain, the new 2016 LandCruiser also continues to be spared from any legitimate contenders. 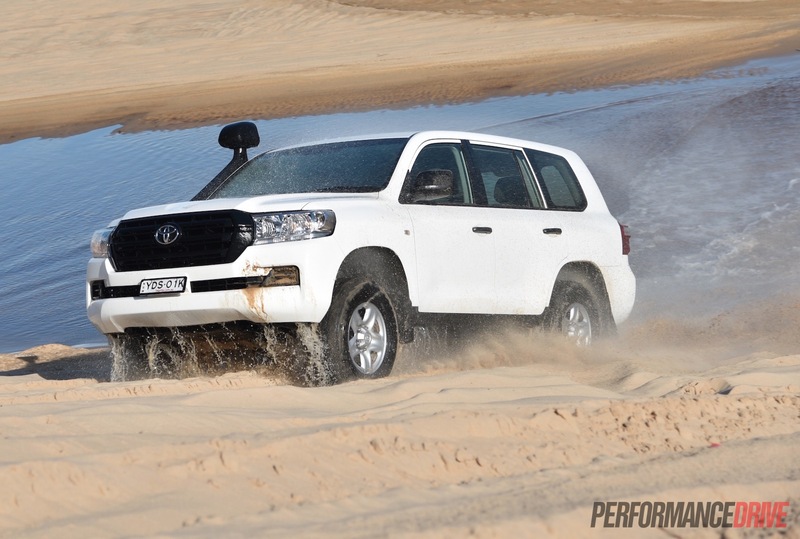 Since its inauguration 65 years ago, the Toyota LandCruiser has embedded itself in everyone’s minds as the go-to vehicle for serious off-road capability, and, just generally being the ‘king of the road’. 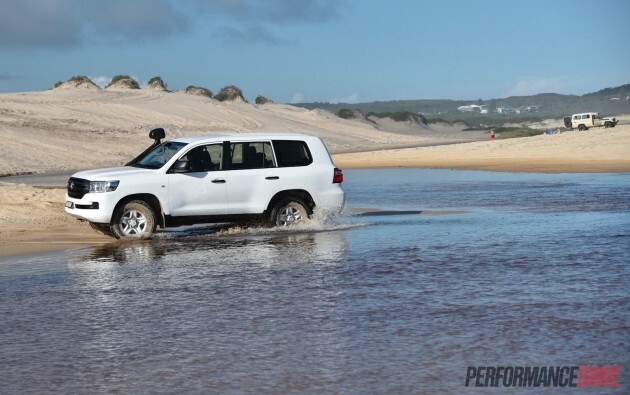 Toyota targets adventurous families and companies needing vehicles for the land with the LandCruiser; offering a size up from the Prado and Fortuner. 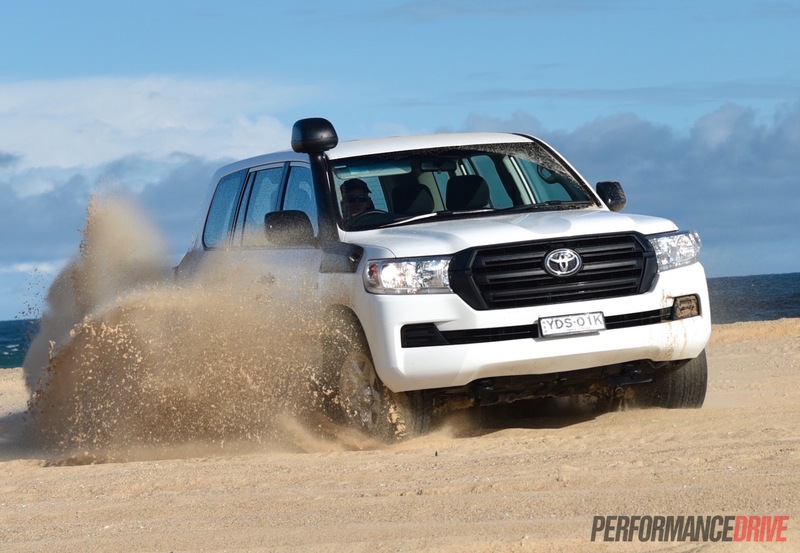 Providing suitably for the above demographics, the LandCruiser now comes in four variants; GX, GXL, VX, and the range-topping Sahara. Here, we’re testing out the GX. 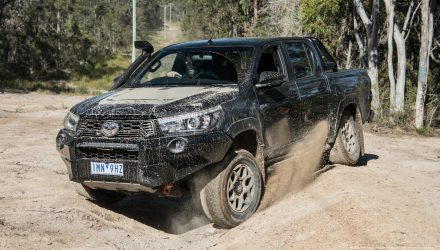 The GX is purpose-built to be the rough and ready, red-raw, no fuss, no ‘bells and whistles’ off-road truck for serious outback users only. 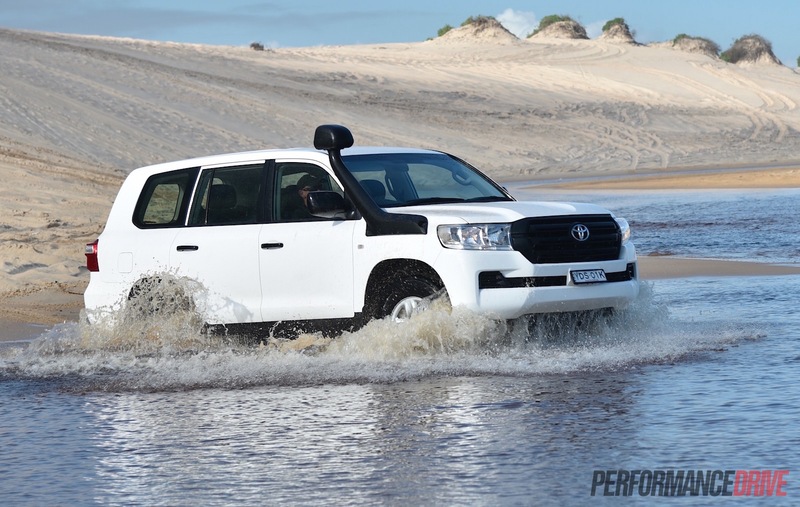 Toyota expects to sell most of these models to mining companies and serious adventurers alike. 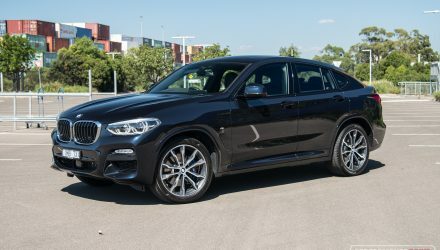 Throughout the range, the same revised 4.5-litre twin-turbo-diesel V8 engine producing 200kW and 650Nm is offered (up from 195kW in the previous model). 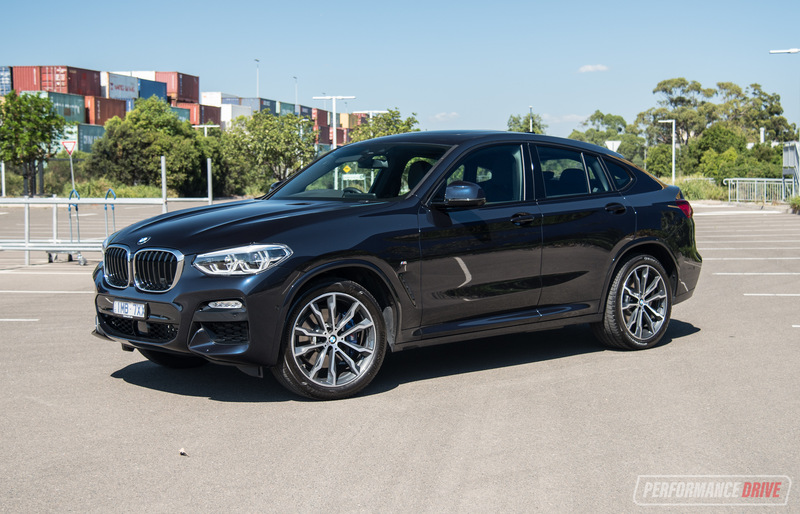 There’s also a 4.6-litre petrol V8 on offer for GXL models and above. 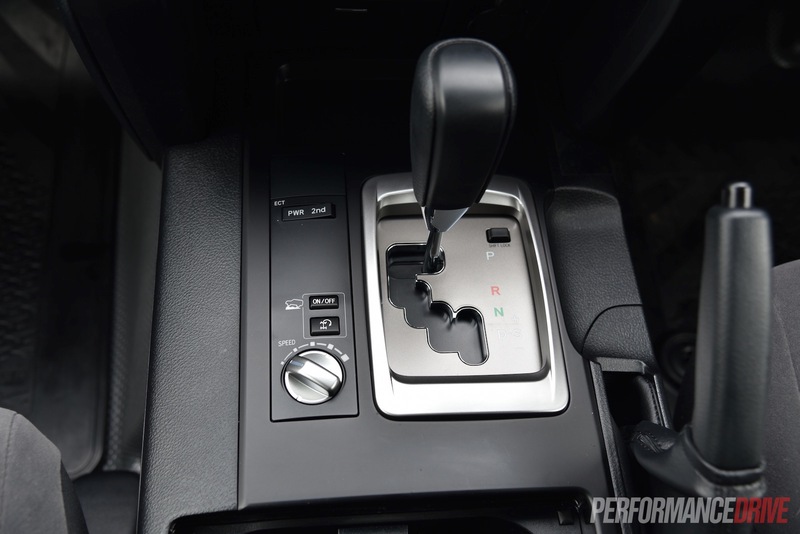 All engines are paired to a six-speed auto transmission with constant four-wheel drive. 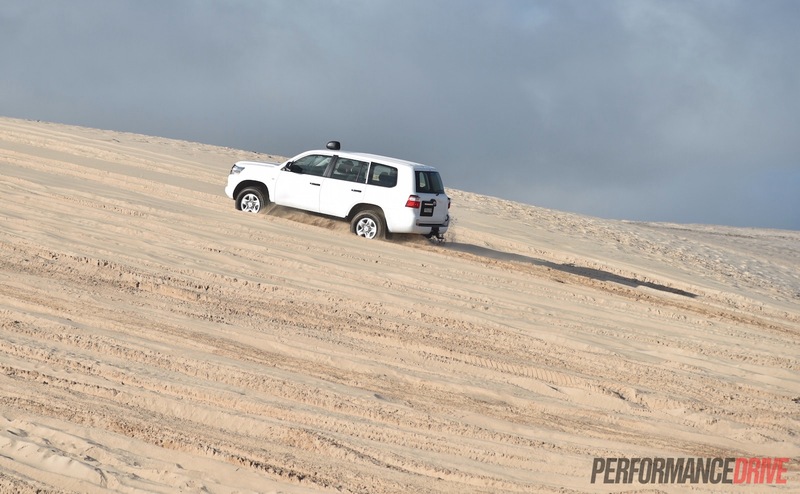 Prices kick off at $76,500 for the GX, through to $113,500 for the no-expense-spared Sahara (excluding on-roads). 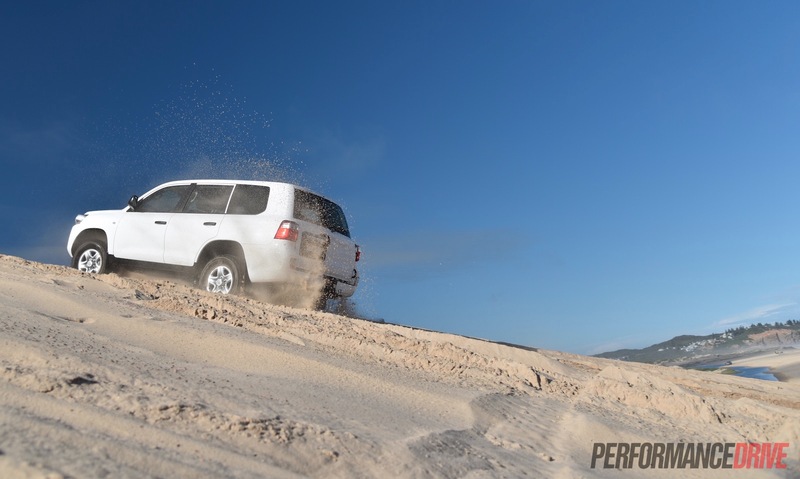 Predominantly being in a league of its own, the Toyota LandCruiser GX is a heavy-duty off-road SUV in the raw. If you expect a bit of glitz and glamour, look at the GXL and upwards. With that in mind, the GX’s interior is nothing close to flash. But it’s not meant to be. 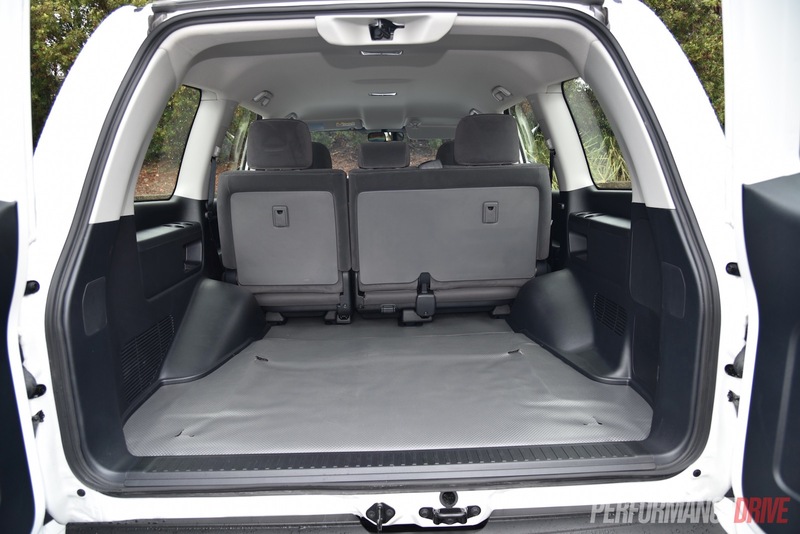 Toyota has stripped the GX back to basics, with durable plastics and cloth fabrics for that robust and rugged treatment. Even the carpet has been replaced with rubber/vinyl so you can get the interior muddy and wet, and it will be easy to clean/hose down. 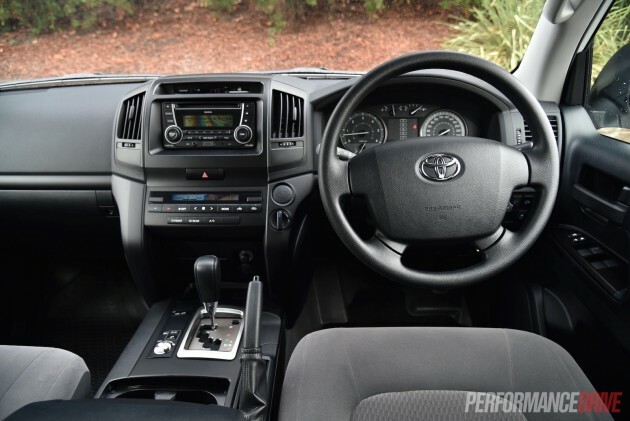 Although the interior aesthetics have little concern here, the GX is still attractive enough to feel modern, with a semi-sculpted dash and a flowing layout for the controls. 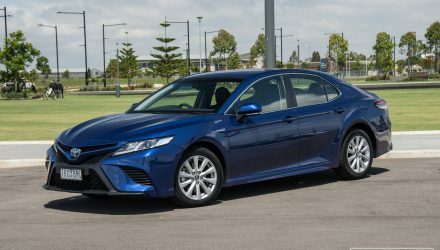 The seats are soft and supportive for those bumpy roads, and they’re situated to provide good headroom and legroom in the front. Unlike in the Toyota Fortuner, the steering column offers acceptable rake and reach adjustment, resulting in an ideal driving position that places you up high; which is much needed in order to see over that towering V8 bonnet bulge. There isn’t going to be any complaining about room or comfort in the back row. The rear bench is humongous while still leaving plenty of headroom and legroom for all three. 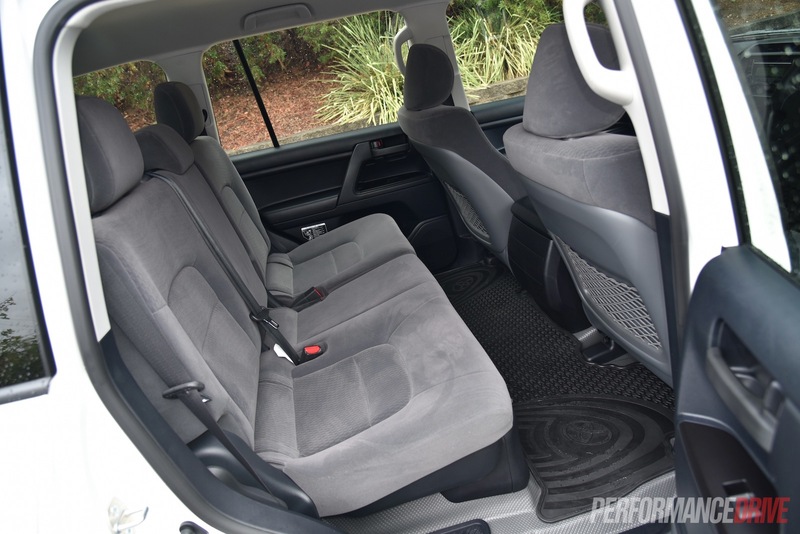 The GX misses out on the third row seating option otherwise offered with higher variants, but we don’t see that as much of a problem given the GX’s target market. Luggage space is rated at an unbelievable 1431 litres – up from 1080 litres in the Fortuner, and up from 974 litres offered in the baby brother Prado. 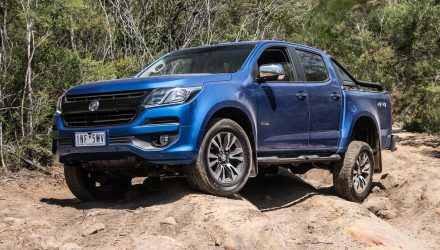 It even soars past the 1050 litres offered in the new Ford Everest. 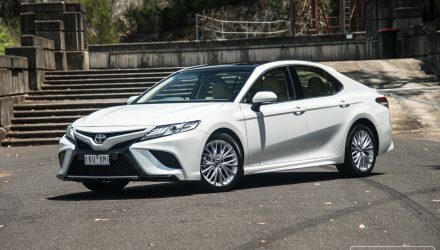 This is the largest cargo capacity Toyota offers in a passenger vehicle, and probably one of the largest of all passenger vehicles currently on sale in Australia. 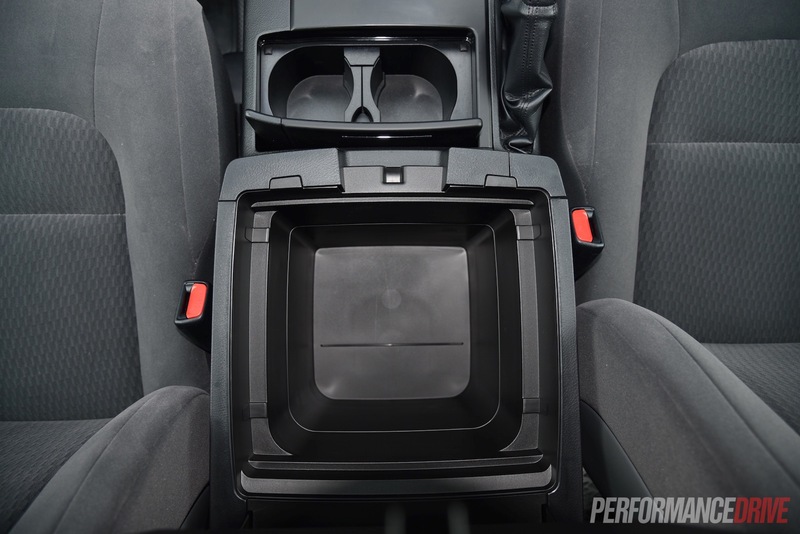 There are some handy tie-down hooks in the back to secure your cargo, and loads of storage pockets and cup holders throughout the cabin, including a huge centre console box. 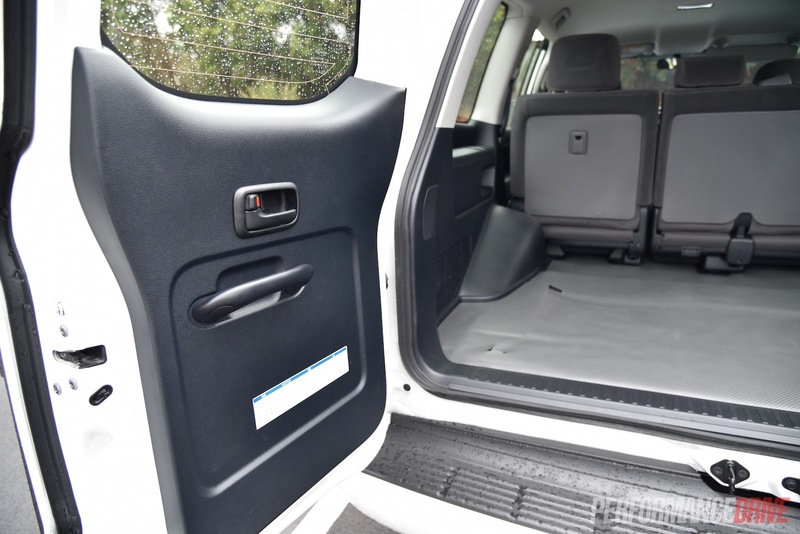 Exclusive to the GX, and possibly an annoyance to some, are the rear barn doors, aka, dual vertical-hinged tailgate. The rest of the range get a double horizontal arrangement; an up-swinging and down-swinging door. 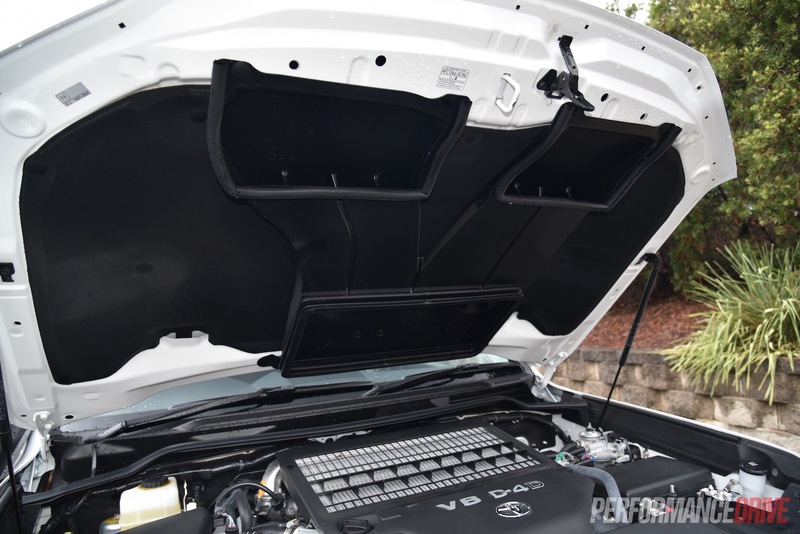 Also standard in the GX only is the massive rear-facing snorkel air intake for the engine, which exemplifies precisely what this variant is intended for. Don’t expect any fancy touch-screen displays in the front, or ‘automatic’ conveniences. 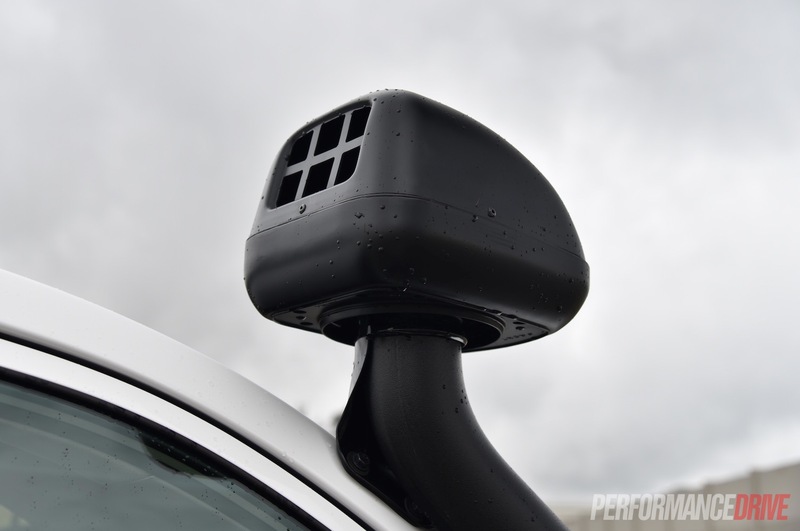 There’s no auto climate control, no rear camera or parking sensors, no rear air vents, no auto headlights or wipers, and a basic four-speaker stereo – in fact, not even variably intermittent wipers come with this beast. 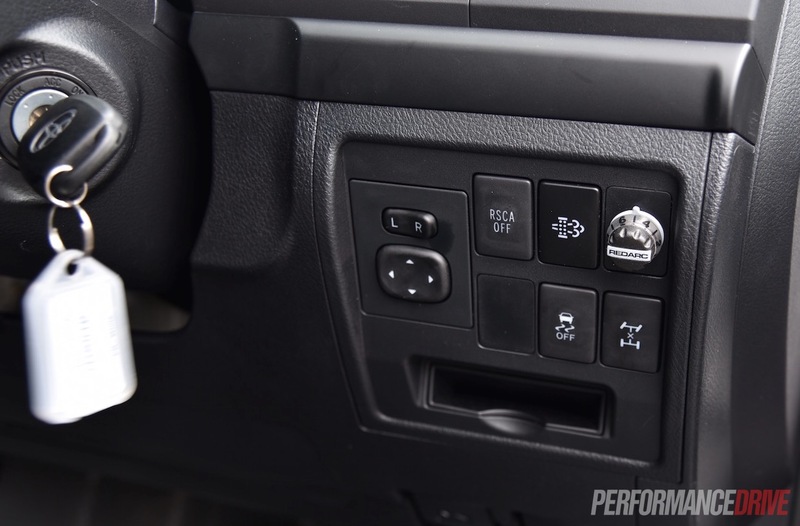 Though, you do get Bluetooth phone connectivity and cruise control as standard. 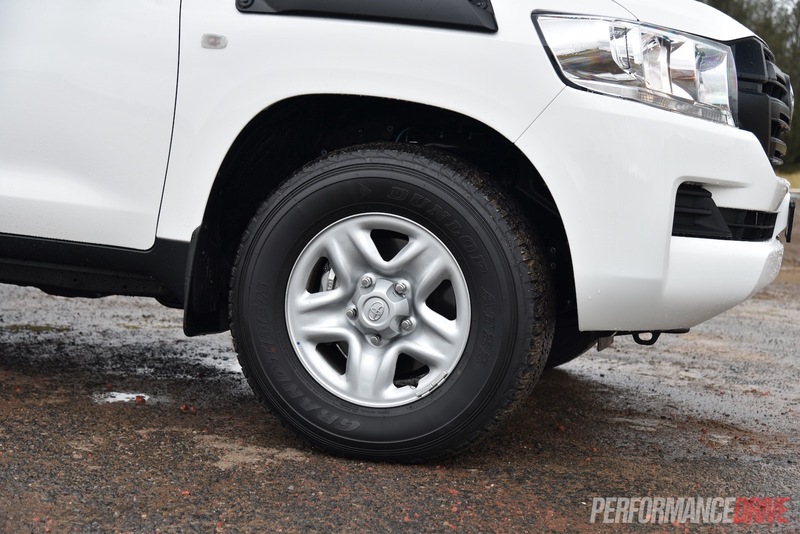 As you’ve probably noticed, the GX doesn’t come with alloy wheels. Instead, it gets 17- by 8.0-inch steel rims to match the off-road personality and go-anywhere intentions. They are wrapped in moderately-patterned 285/65 tyres front and rear. 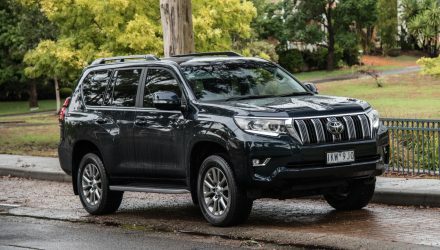 On the road the LandCruiser still feels like a tall, high-riding 4×4; and probably the biggest-feeling 4×4 you can experience on the new-car market. As mentioned, short drivers may have trouble seeing over the huge bonnet. 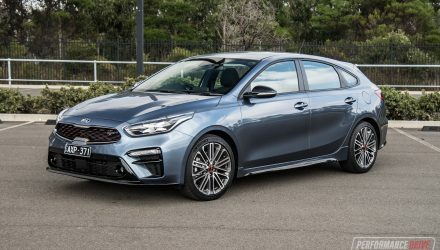 The vehicle is built on a solid ladder frame chassis underneath with a live-axle rear end and coil springs, and double wishbone independent front suspension. Handling is quite composed for such a large mass. It leans into corners and doesn’t give into significant body roll until you really push it. 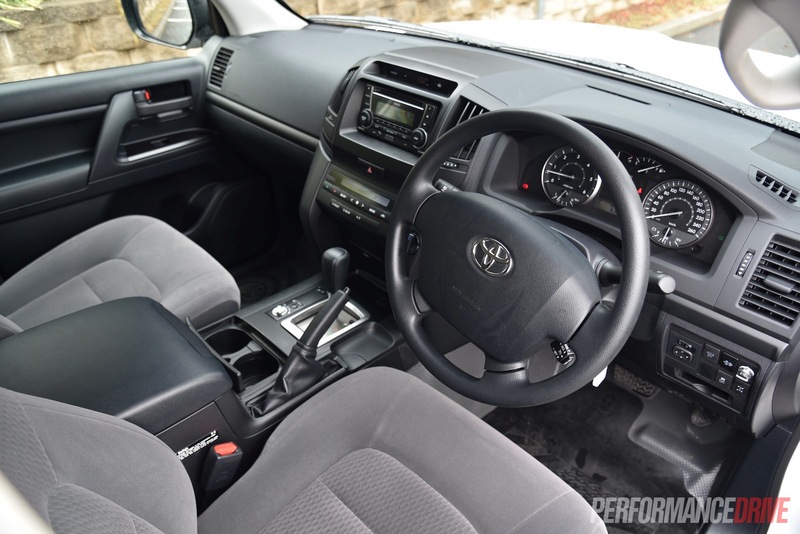 Steering is as expected, truck-like, with a relatively mild weight. 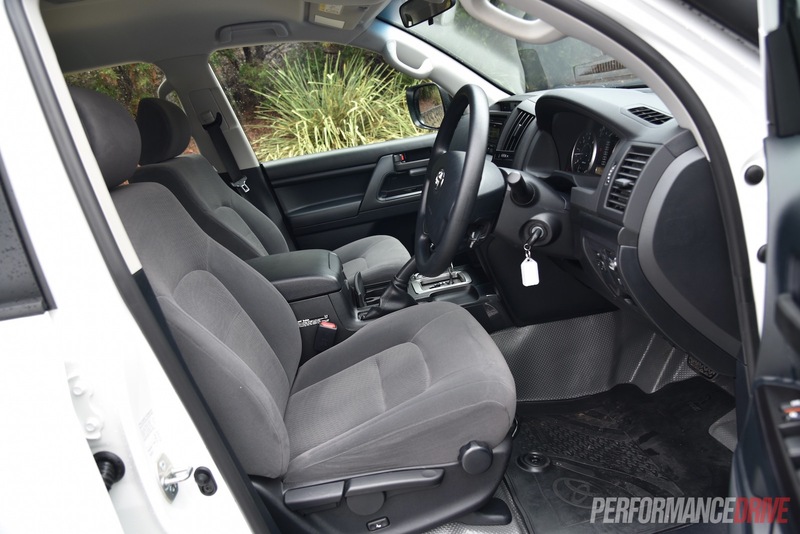 More steering wheel rotations are required than a regular SUV due to the slow rack and pinion gearing that is ideal for technical off-road driving. 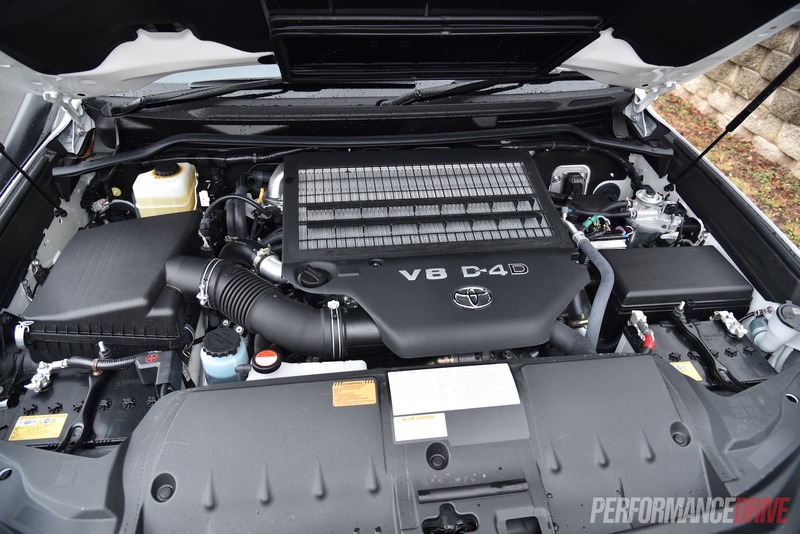 As for Toyota’s updated 4.5-litre twin-turbo-diesel V8, the unit is reasonably refined with a nice V8 burble at some parts of the rev range. The unit is respectably quiet too, registering just 80.1dB in the cabin during full-throttle acceleration, and 51.3dB at idle. 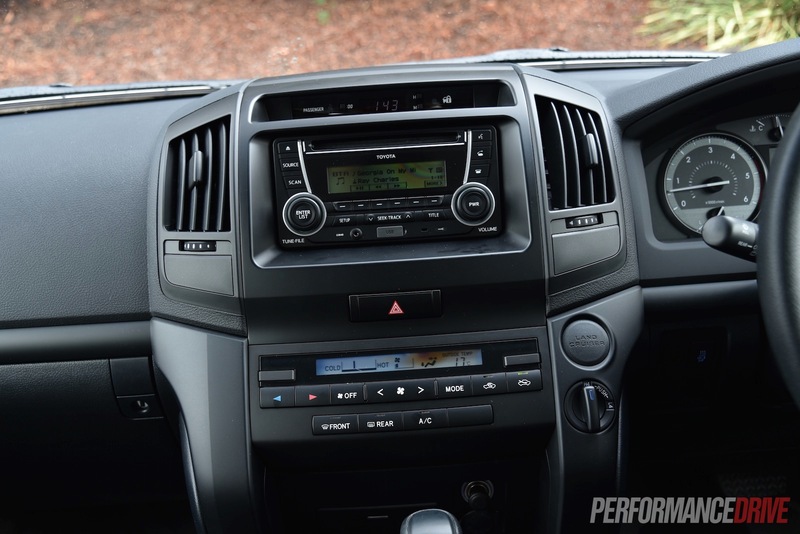 For example, the four-cylinder Fortuner registered 88.2dB and 54.6dB under the same tests, respectively. This is a side benefit of going for a V8; engines are typically smoother the higher the cylinder count. 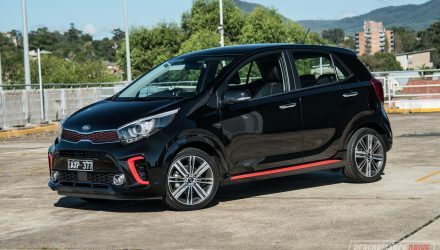 It goes about all its on-road and off-road business effortlessly, with 650Nm available between just 1600rpm and 2600rpm. 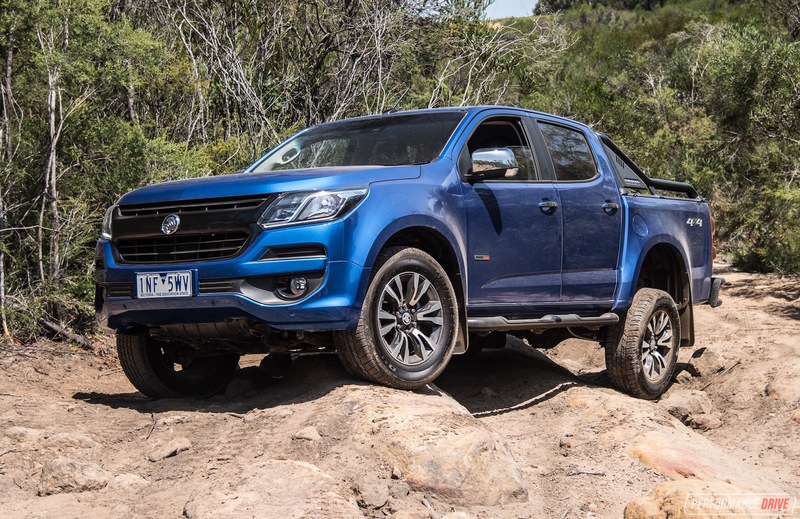 Even when combining its sheer weight with towing another weight, the engine is never breathless. Unfortunately, the trade-off is that you are operating a bit of a guzzler. 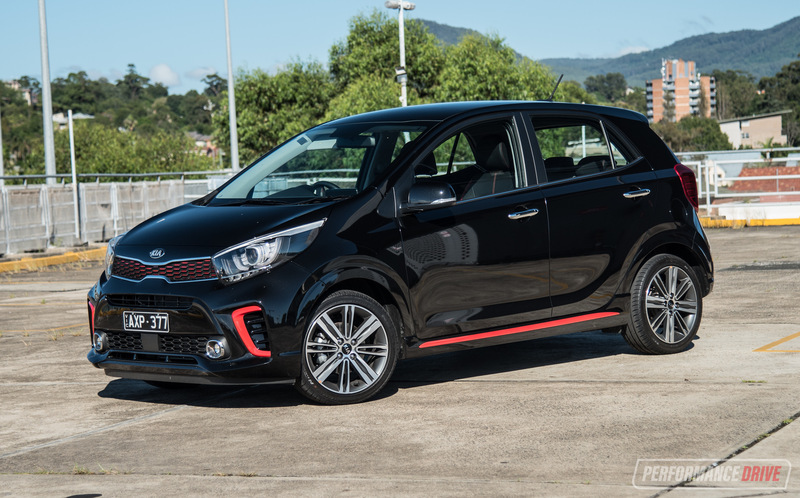 Fuel economy is a vast improvement on the petrol option available in the higher spec models. But even still, the official readings measure 9.5L/100km, and we were never able to achieve under 10.5L/100km. The engine is matched to an equally sturdy and strong six-speed auto. 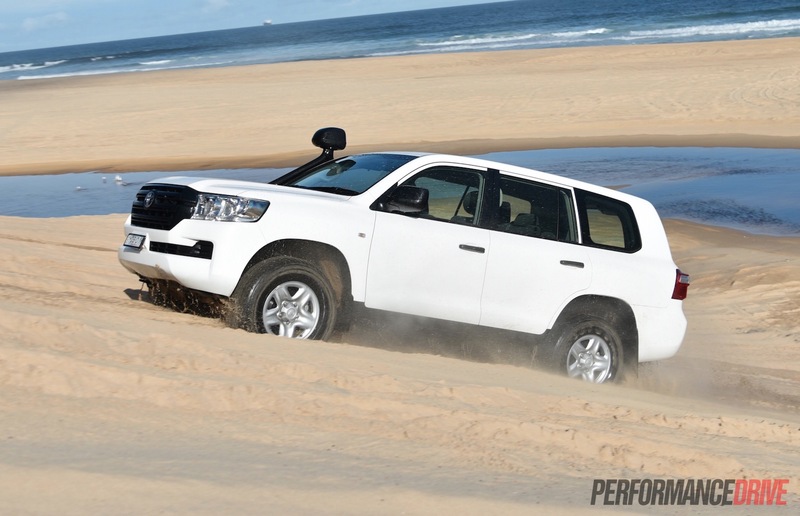 It handles towing up to 3500kg perfectly. 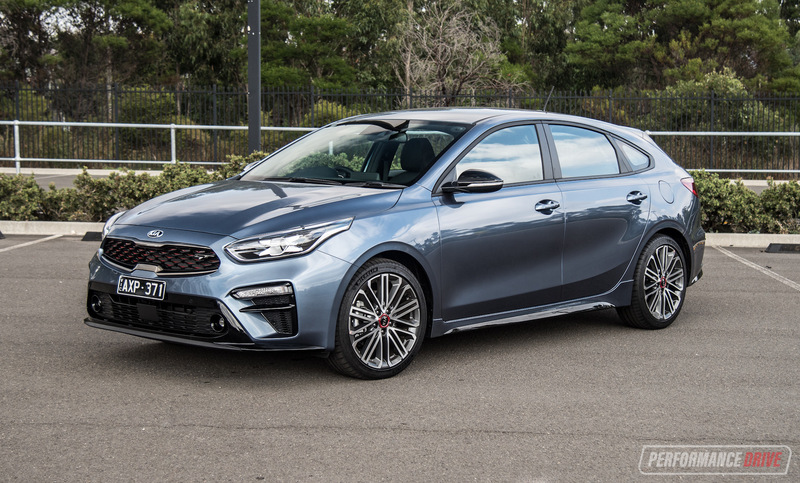 As such, the brakes feel like they could stop the earth from rotating, with our 100-0km/h test recording a best of 44.32 metres in 3.6 seconds. Flat out, we timed 0-100km/h in 8.92 seconds and the quarter mile in 16.9 seconds. Even though it is an enormous vehicle, the V8 has no trouble keeping up with traffic and powering past others during overtaking. 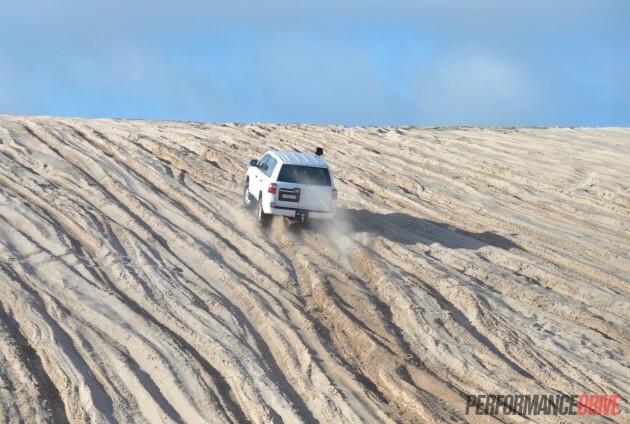 Now to the serious stuff; off-road driving. 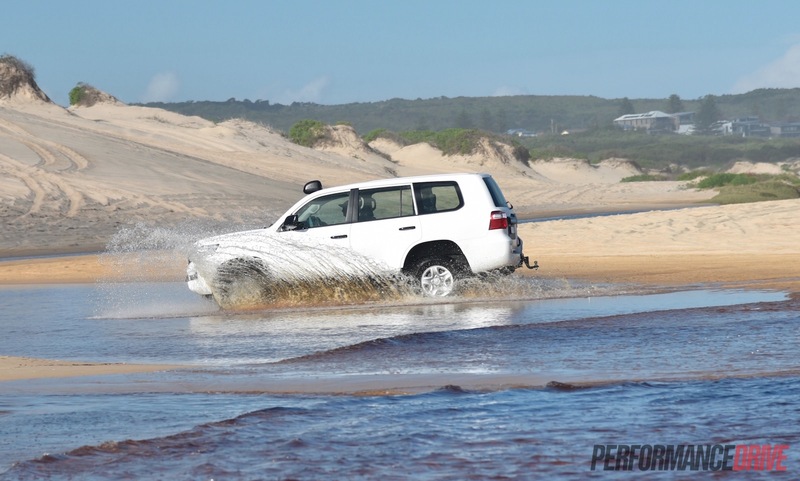 The Toyota Land Cruiser GX doesn’t fall short of exactly what it is designed to be; an all-terrain, all-land-domineering, bush-bashing machine. It’s hard to find the Land ‘Crusher’s’ limits off road, except for when its sheer size gets in the way of a narrow track. 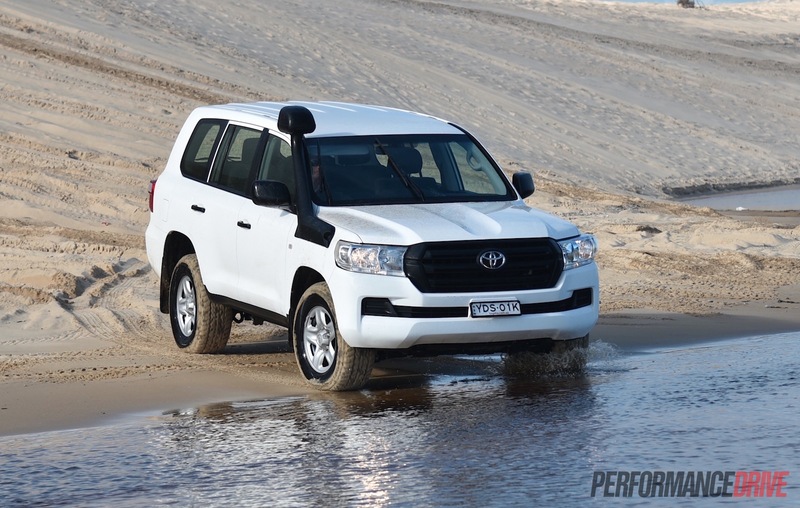 There is a hefty 225mm of ground clearance available, on par with the Ford Everest and 5mm short of the Nissan Patrol. But with the amount of protective plates underneath, hitting the ground isn’t as dramatic as you might have thought. In fact, when it bottoms-out, you can only hear a calm and collected thud, and it makes no difference to forward progress at all. 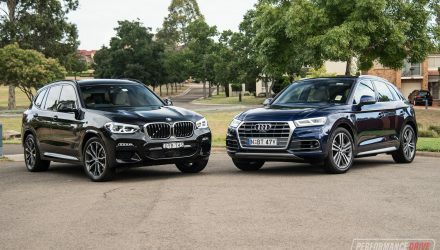 For such a wide and long SUV, approach and departure angles are polite, rated at 32 degrees and 24 degrees, respectively. 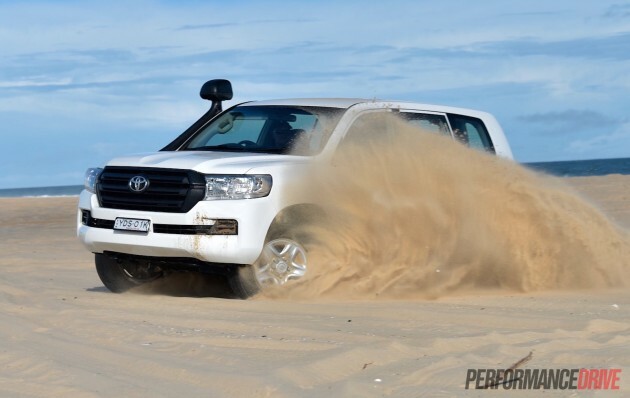 The off-road performance is nothing short of astounding. 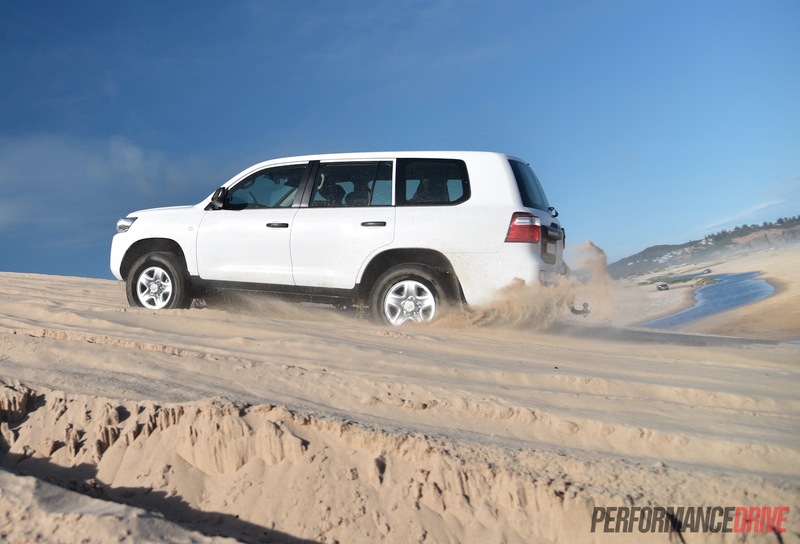 Traction is supreme, partly thanks to the 2630kg tare weight, and also thanks to the standard locking differential. The low-range gearing makes for crawling up and down the steepest of tracks a walk (or drive) in the park. And then there’s Toyota’s next level CRAWL control system. 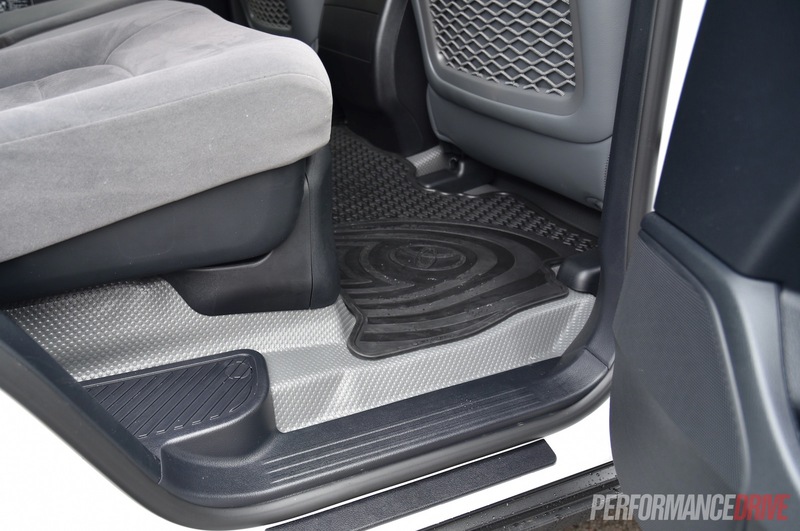 This new feature is a “feet-off-the-pedal” control system that helps take the vehicle over severe and slippery terrain, especially in climbing or descending steep hills. 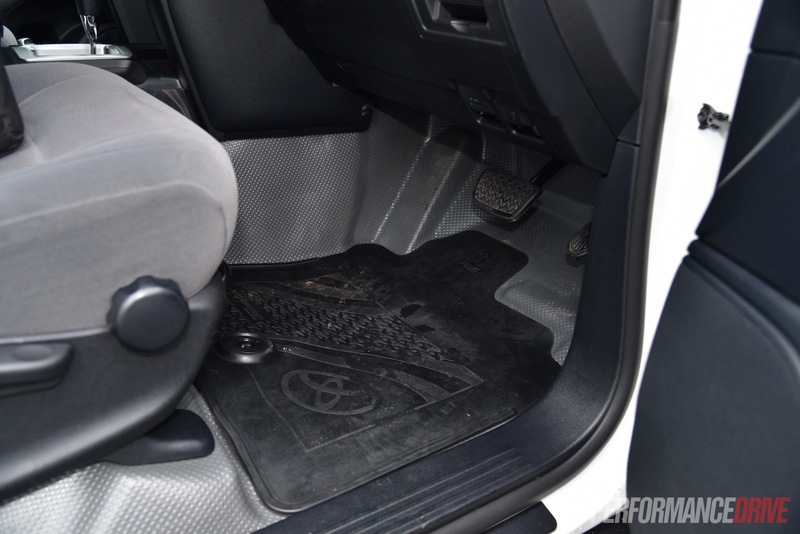 It also helps in freeing the vehicle if it is stuck in mud, sand, or fording water. A handy speed dial provides the choice of five speeds. The system robotically maintains a low consistent speed uphill and downhill by calculating both engine output and brake force, allowing the driver to concentrate fully on steering. We found this a perfect innovation to help overcome the reality of controlling such a large vehicle because it enhances vehicle stability by minimising wheel spin and tyre lock-up. 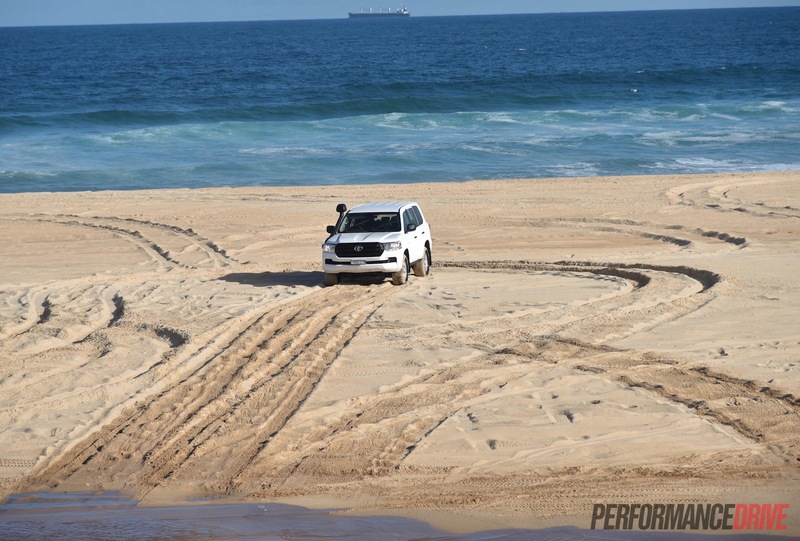 To add to the myriad of off-road features, there is also ‘Turn Assist’. Available throughout the range, Turn Assist brakes the rear inside wheel to help tighten turning circles. Backyard tests have shown that turning circles are improved by about 5 per cent. Turning measured 11.8m with the centre diff unlocked, 12.7m with it locked, and 11.3m with it unlocked and Turn Assist operating. 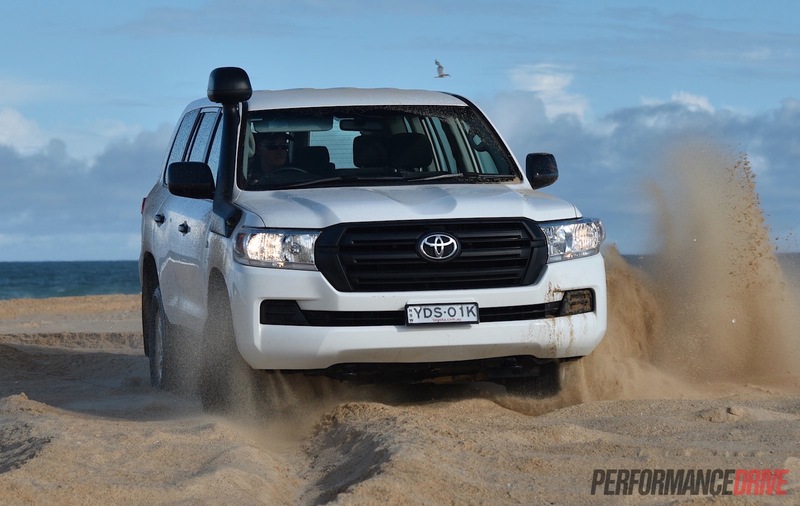 As we’ve said before, if you’re after outright off-road performance, nothing compares to the ‘Cruiser. 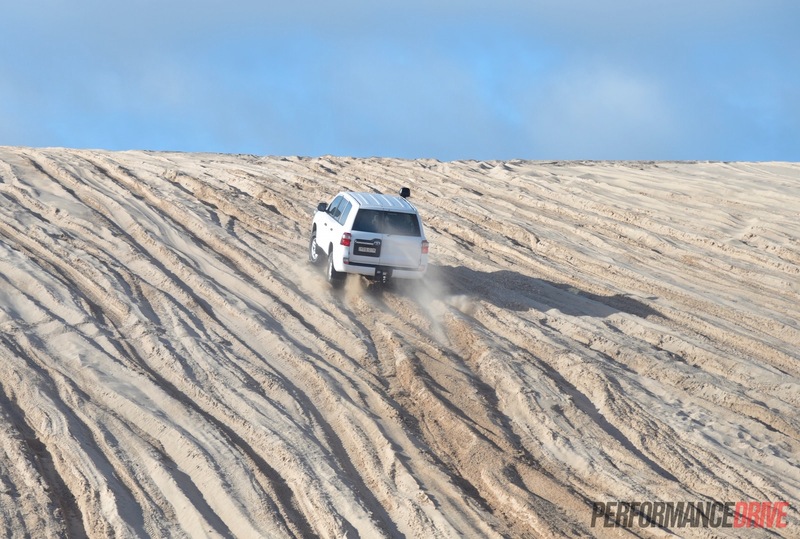 It is incredibly relentless when forging through unforgiving terrain, and you get the sense it will keep going and going while other more fragile competitors fall behind. 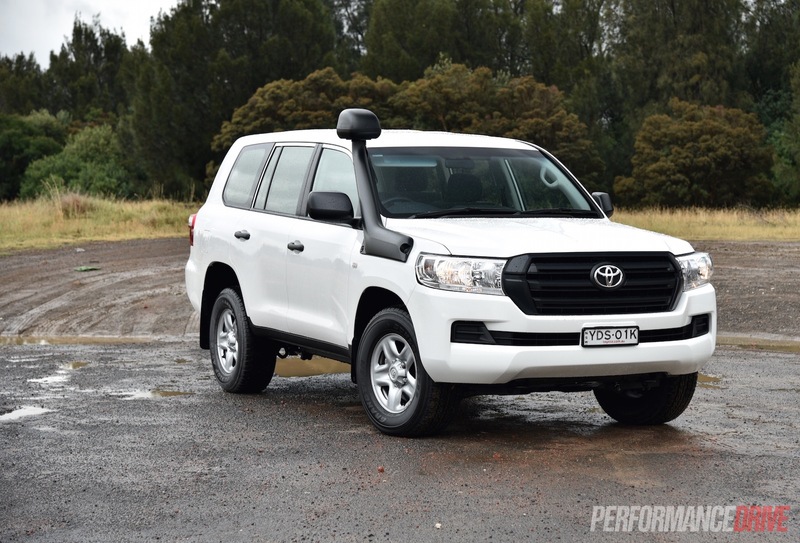 With this 2016 update, the Toyota LandCruiser continues to sit at the top of the SUV food-chain, far away from any legitimate contenders. 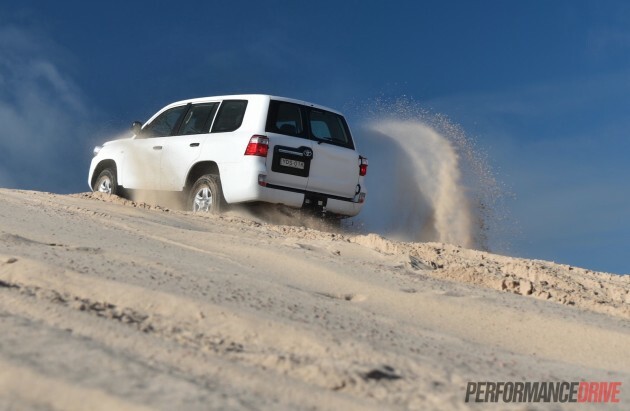 If you need a ‘go-all-out’ SUV and expense isn’t an issue, the LandCruiser continues to be the pick. Whether it comes from the need for towing a house, living among the harsh outback, or having a constant urge for adventure (and torque), the LandCruiser is the only true heavy-duty SUV you should be looking at.